This issue begins with a somber funeral for Professor X. It is pouring rain and the X-Men are all in mourning. The funeral is interrupted when Quicksilver arrives, but he leaves as soon as Xavier’s students notice him. After the funeral, the X-Men return to the mansion and watch a final video message from Professor X. In the message, the Professor let’s the X-Men know that he was dying of an incurable disease so he would have died even if he did not get wounded in the explosion. The message ends with Professor X warning his students that Magneto has returned. The issue then switches gears and goes to Magneto’s new hideout on an island. It is revealed that Quicksilver and Scarlet Witch left the Avengers and joined Magneto again because Wanda has lost her powers and Magneto has promised that he will bring her powers back. 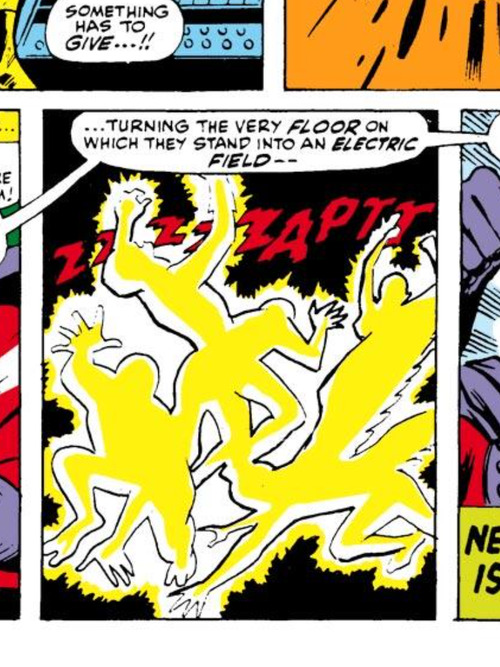 The X-Men are able to find Magneto’s base, but Magneto is prepared for them and the villain easily defeats his enemies by electrocuting them. The comic then breaks from the main story to give us some information on how Cyclops’ powers work. 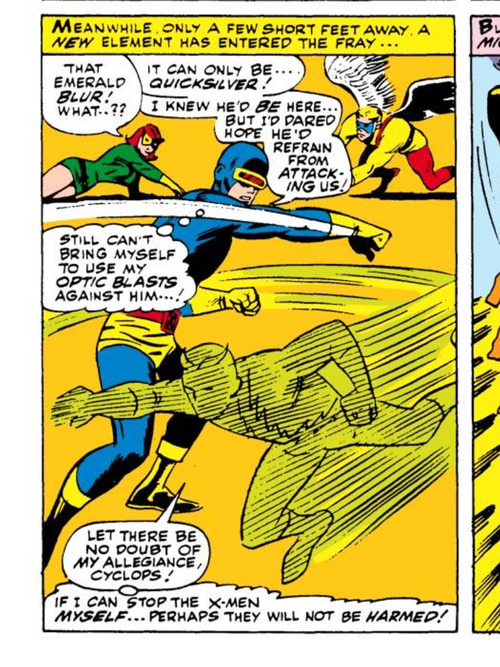 Cyclops’ eye beams come from the power of the sun. He absorbs sunlight throughout the day and then uses this light energy to create his energy beams. 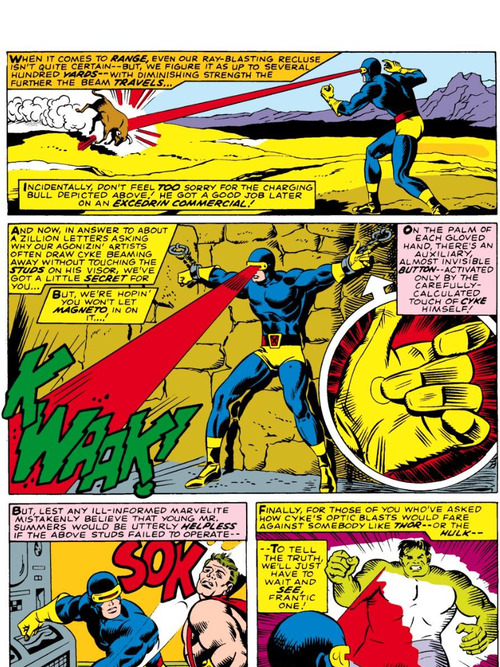 It is also revealed that Cyclops’ eye beams do not create heat and the beams can travel several hundred yards. I was excited for this issue and the comic did not disappoint. Although, Magneto was not in most of the issue, it was great to see his return and I can’t wait to see the rest of his plan unfold in the next issue. It was also great to see Quicksilver return and fight the X-Men. Like always, Quicksilver is very conflicted in this issue. He does not want to work with Magneto, but he feels like he needs to join him to help his sister. 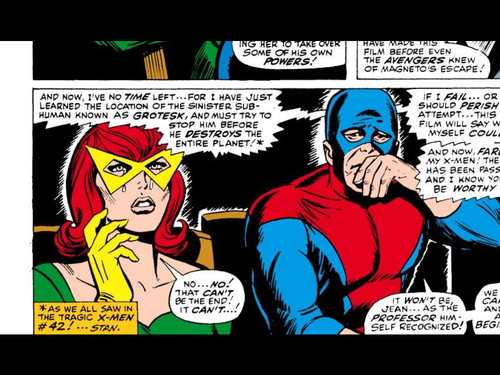 Pietro is also conflicted when he battles the X-Men. He tries his best to defeat them without harming them because he knows that the X-Men are all good people. 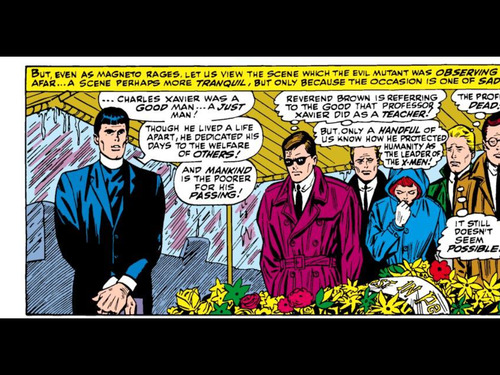 Quicksilver’s struggle with his allegiances is shown most effectively when Pietro visits Professor X’s funeral. The speedster is genuinely saddened by the Professor’s death and he struggles to cope with these feelings. The background information on Cyclops wasn’t all that exciting, but it was interesting to learn some facts about his powers. 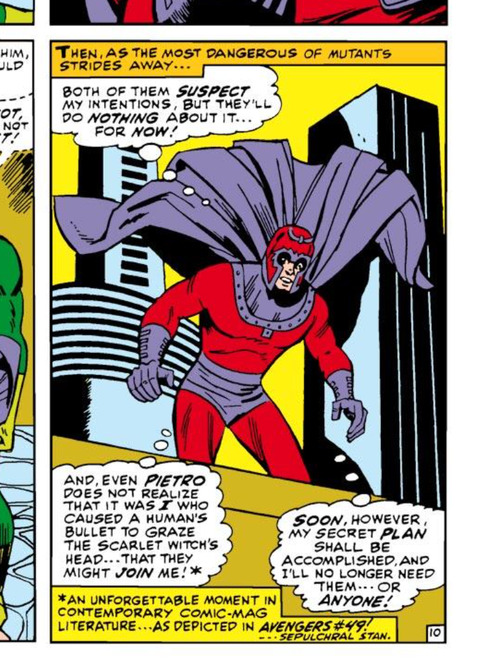 I wish they waited until later to show this information though because I wanted to see more Magneto in this issue instead. Overall this issue is very solid and I didn’t have anything big to complain about really. 1. There is metal in basically everything, making Magneto extremely powerful. 2. Another Cyclops tidbit. 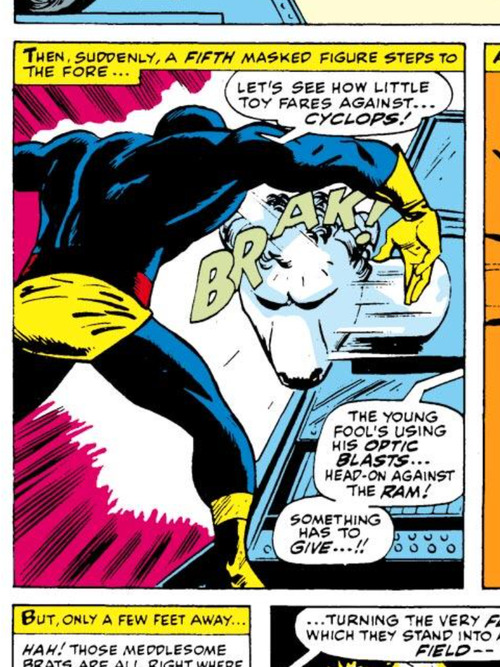 Apparently Cyclops has a button in his glove that can open his visor so he can shoot his eye beams. 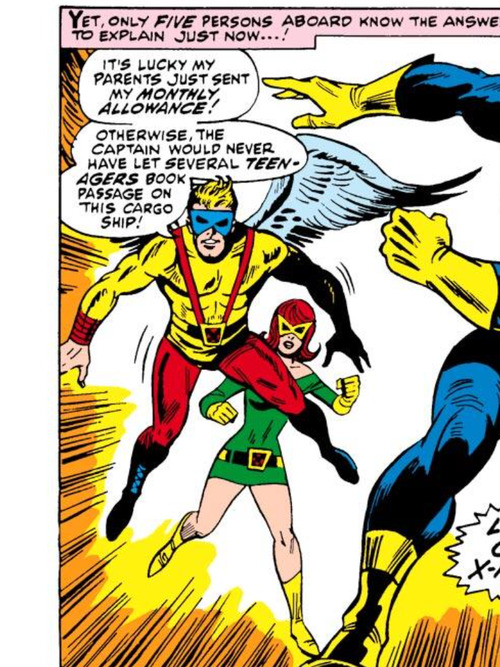 This will be very helpful in the future because in the past, Cyclops is always helpless when his hands are bound. 3. Apparently the X-Men are now funded by Angel’s allowance from his rich parents. 4. Magneto is actually the one who wounded Scarlet Witch and got rid of her powers so Quicksilver would join him. This will definitely come back to Magneto later in the comics. 5. I enjoyed this sad panel of Jean and Beast crying. 6. 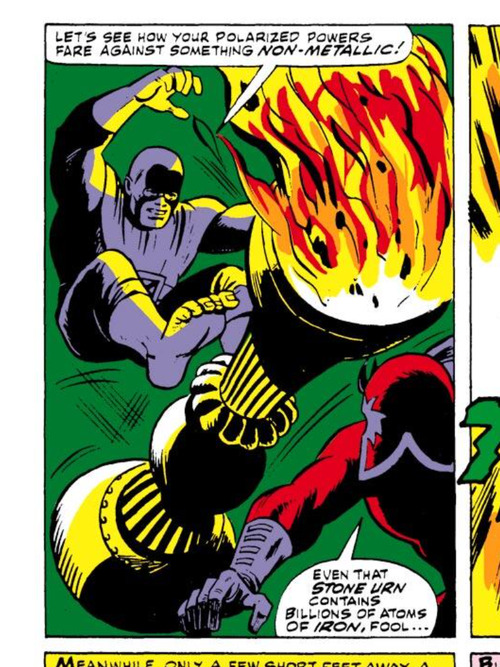 Magneto attacks Cyclops with a battering ram that actually has a ram as the point. 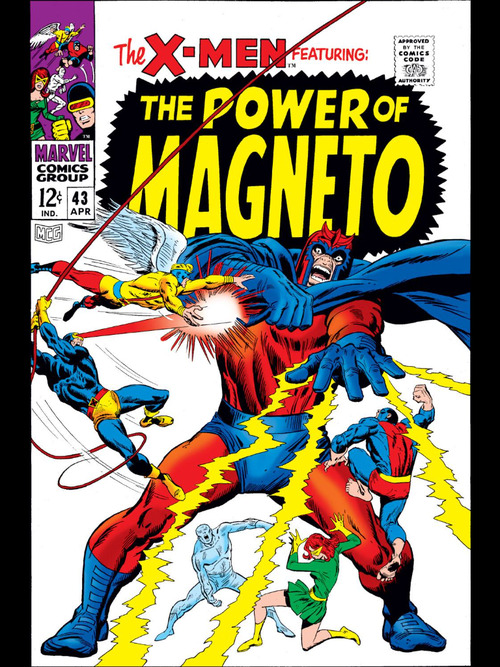 Magneto is often depicted as having powers over all metals. But does that make sense? My kitchen magnet is not at all affected by by aluminum flask. Although the grand majority of elements are metals, magnetism really only affects greatly iron, cobalt and nickel and their alloys. (So steel is included, because it is essentially iron with some impurities.) A flashback story about Xavier and Magneto has him moving a whole lot of gold, but gold is not magnetic either. But they have to make Magneto powerful or there is no story. In theory, Magneto could manipulate Iron Man with ease. But an Avengers story once had it that he could control all humans by controlling the hemoglobin in their red blood cells. But there are no known bad effects from being next to strong magnets; the hemoglobin has iron atoms bound up with other atoms so a magnet can’t affect them. 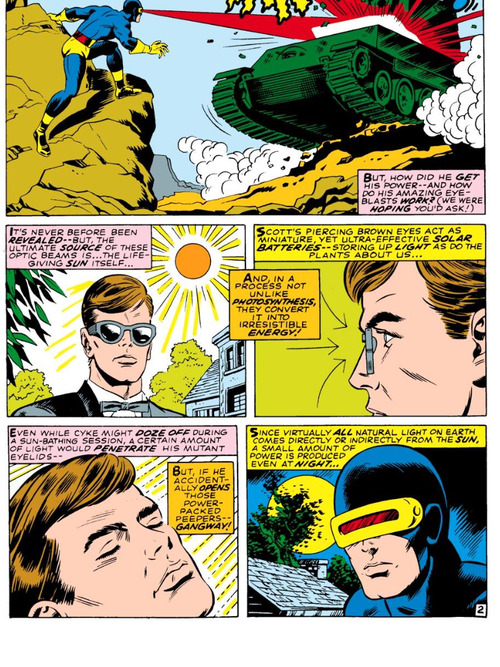 Also, about Cyclops: later on, he uses a visor that can be controlled by his eyes alone; I can’t remember exactly how. And he can stop the beam by closing his eyes; but then he can’t see. The visor or his special sunglasses allow him to control his beams and still see. And his brother Alex/Havok also shares his ability to get power from the sun. But Havok has more control over his energy; there is less danger of blasting people unintentionally. Once I remember the flying lizard villain called Sauron using the two brothers like two batteries, to give him power! It’s funny to see that at one time, comic books only cost 12 cents! I wish they still did! Me, too!!! When I started to buy comic books, I think they cost 25 cents. Wow. And now they can be $4.99 or even more for a special issue. I need a time machine. Yeah? Well, go back in time and try to use your modern money and see where it gets you! You could be arrested for counterfeiting! I love this issue as well and this is the oldest issue of The Uncanny X-Men I actually own a physical copy of. Great review! Thanks I’m glad you like it! That’s a great issue to own too. Keep it in good condition!